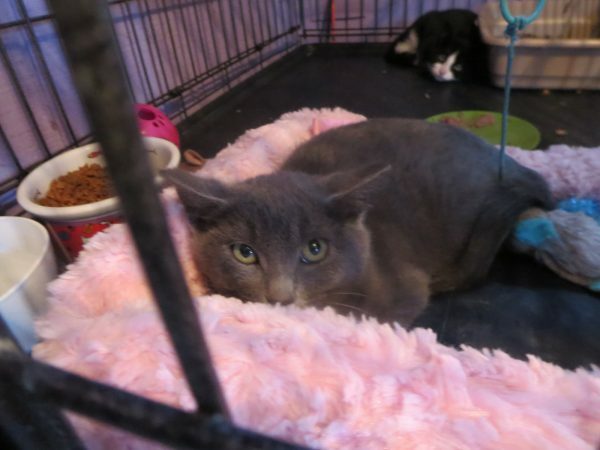 Bonnie or Bill the little all gray domestic short hair and Clyde black/white domestic short hair hiding in the background are adoptable little ones, soon that is. They have to be 2 lbs to get them fixed (spay/neutered) at our low cost, high quality clinic in Empire. These two love to play, climb, jump and just have a good time. They are not super friendly but you can pick them up, ears back and eyes always on you They will need a quiet home, lots of attention and no other animals or small children. They will need your full attention in order to become the best cats ever.